The city of Suzhou, just west of Shanghai, is famed as a Venice of the Far East with canals, bridges, formal gardens and classical architecture. But in keeping with its modern, bustling population of nearly 11 million, the city has added some avant-garde. 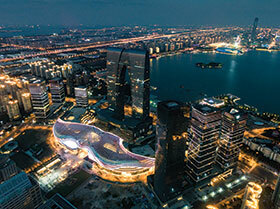 One of the newest showpieces is the ultra-modern Suzhou Centre, a 1.1 million square-metre waterfront complex of shopping malls, office buildings, residential towers and a sumptuous hotel. The centre, opened in November 2017, ambitiously aims to become one of China’s top international business hubs. How fitting, then, that the centre’s security system is also avant-garde. It comes from Bosch, and it provides video surveillance, intrusion alarm, access control and public address systems. Over 3200 Bosch HD cameras secure every aspect of the Suzhou Centre, covering the full range of operational security needs from surveillance to tracking. High-level surveillance is ensured through fixed DINION and FLEXIDOME IP cameras as well as AUTODOME IP pan, tilt and zoom (PTZ) cameras. In addition to its surveillance functions, the AUTODOME IP dynamic 7000 HD cameras feature intelligent object tracking allowing security personnel to track moving targets automatically. If an object is detected, the camera’s Intelligent Tracking feature is triggered, based on a predefined alarm rule or manually by a simple click. Once Intelligent Tracking is activated, it ensures uninterrupted tracking of moving objects. Intelligent Video Analytics embedded in the AUTODOME IP cameras can trigger alarms automatically when a pre-defined alarm rule (e.g. a person crossing a line) is met, alerting guards and identifying potential security issues. Eight Bosch Video Management Systems (BVMS) integrate all 3200 FLEXIDOME, DINION and AUTODOME IP cameras for central management by the main control centre. Intrusion detection is managed by seven DS7400 intrusion panels that have over 200 sensors. Each of these can be programmed for up to eight areas and are programmable by local keypad or remotely. Access control is handled by two installations of Bosch’s Access Professional Edition (APE). APE controls doors, making sure only author-ised personal can enter restricted areas. It also exchanges information regarding door control and door status with the other security systems. For public address and evacuation instruction, Bosch has supplied a Praesideo system with over 5 000 ceiling and cabinet speakers that are broken into over 80 zones and managed from two control centres. Thanks to its sound quality, the Praesideo system also provides background music in the public areas of the Suzhou Centre.